With all of my being, I send out love and blessings to all of you for this new year, 2019. May it be a year full of peace, presence, open-hearted communication, expansion and love. I have spent the first few weeks of the year fallow and quiet with the intention of listening to my soul and the soul of the world, to gain insight on how best I might serve my community in grief support and soul tending. As I’ve gotten quiet, I’ve been reminded of how in our culture, there is a certain amount of pressure on us to enter into a new year with much zest, positive intentions and forward movement. It has been an interesting process to watch myself through this fallowness. I’ve witnessed the layers of cultural conditioning arise in myself with thoughts around not being ‘productive’. I’ve heard my Father’s hard-work-ethic driven words in my ears and noticed parts of myself feeling guilt. I’ve also watched how when I allow myself to be quiet and receptive, my body softens, heals and regenerates, my mind quiets and my soul speaks to me in dreams, insights, ideas and inspiration. Through my choice to turn towards this deep, fallow listening in the dark beauty of winter here in Northern California, I’ve become clearer and more dedicated to the work that I do. I view grief as a profoundly intimate, ripening experience that connects us, if we choose it, to our soul. This connecting and listening to our soul, is where I feel deeply called. Living a life of soul is a life of fullness, of beauty and of deep receptivity and interwoven connection with all of creation. As the brilliant psychologist, James Hillman says “The world and the gods are dead or alive according to the condition of our souls”. Living a life of soul feels to me, like the antidote of so many issues we face in our world today. As we reclaim our wounded and cast-off parts of self, we are able to re-member our wholeness. In re-membering ourselves, we not only bring forward aspects of self lost before experiencing grief, illness or hardship, but we re-member ourselves into a community of beings living their lives fully felt, fully embodied and fully present to show up in our world and act from that place of wholeness. When we are whole, we are no longer striving or competing from a place of lack. 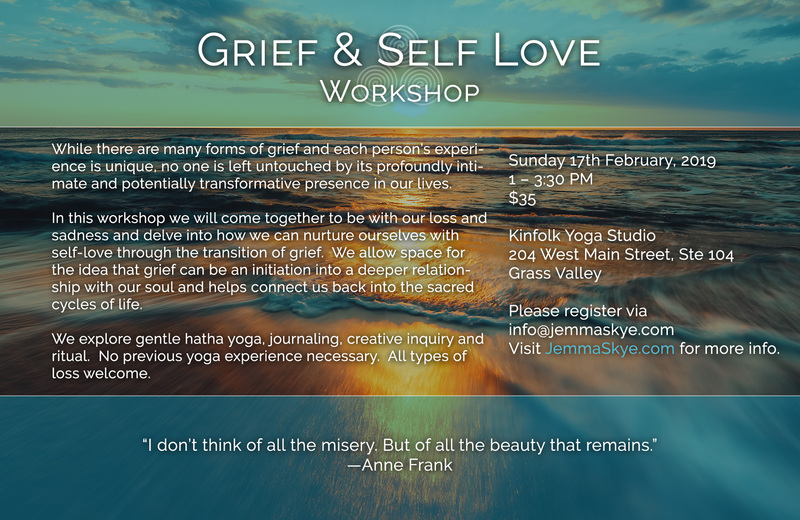 To this end, I will be offering a Grief and Self-Love workshop on February 17th from 1 – 3.30pm at Kinfolk Yoga Studio. This workshop is a supportive space for those moving through the transition of grief. It is also for those who are interested in learning ways to tend to themselves and their souls, with great care along the journey. We will explore journaling, creative writing, gentle Hatha Yoga and ritual.  Please register at info@JemmaSkye.com. I am also offering a new client discount on Grief Support & Soul Tending one on one sessions at $50/hr for the first session. I offer sessions in Grass Valley, as well as online. Please feel free to contact me for further information. While there are many forms of grief and each person’s experience is unique, no one is left untouched by its profoundly intimate and potentially transformative presence in our lives. In this workshop we will come together to be with our loss and sadness and delve into how we can nurture ourselves with self-love through the transition of grief. We allow space for the idea that grief can be an initiation into a deeper relationship with our soul and helps connect us back into the sacred cycles of life. We explore gentle hatha yoga, journaling, creative inquiry and ritual. No previous yoga experience necessary. All types of loss welcome.